Heart: Normal and healthy. Most recently screened via Doppler ultrasound at 3 years of age. Pedigree: McCoy is out of Broadsway Burnham and Broadsway Arundel. Click here for a full five-generation pedigree. McCoy (now fondly renamed "Tasha") is now living and thriving in her "forever" home in Vancouver, British Columbia. Tasha is a much-beloved companion who (according to her owner, Elsa) certainly helps to keep Elsa sane through life’s trials and tribulations. 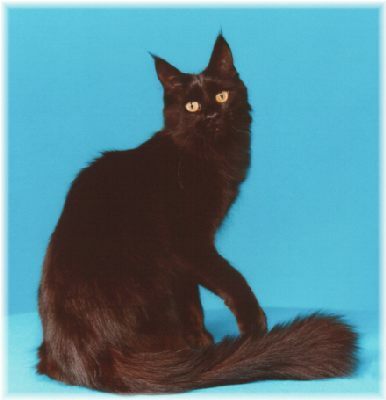 McCoy is a solid black female with gorgeous, dense black coloring and the sweetest, gentlest temperament. She has a very long, hard body, long tail, and good boning. She has large ears with large, thick lynx tips and a very tight set. Her head, profile and muzzle are incredible (unfortunately, you can't see her muzzle well in the below photo). McCoy is an extremely elegant cat, and moves like a ballet dancer: all grace and poise. She is loving, calm, and gentle, and loves to snuggle. She is very patient and goodnatured about virtually everything, and nothing seems to faze her -- including baths, cat shows, the blow dryer, and little boys doing noisy battle with flying Pokemon.